I have a Pollock that is 7-8 years old. It grew with the Dupuis, apparently it came in by error when the grove was planted. It is not a big producer but I would not get rid of it. I love the taste of the fruit. Delicate and simply tasty. The avocado flavor is not in the oil. This only has 5-8% oil but it is great. I love to just eat rice and black beans with Pollock! Something about the flavors. I got a few fruit in the 2+ lbs range in 2011. 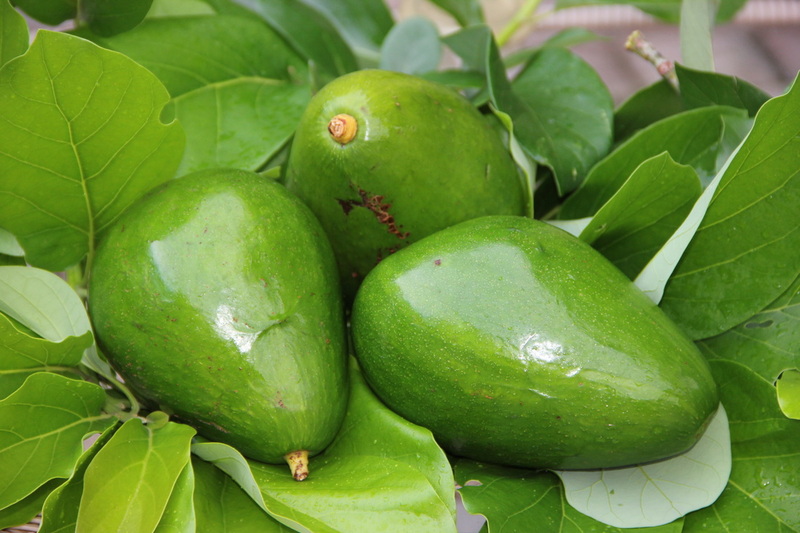 Pollock was one of the first two grafted varieties of avocados grown in South Florida, dating back to 1901. You may want to check this article from 1929 Charles I. Brooks is describing the Pollock, back in the days it was a primary variety in So. Florida. I do agree with Mr. Brooks. I love to eat it. "The Pollock—the good old reliable Pollock. There is a lot we don't like about the Pollock—a lot we don't know, but it is a pleasure to speak of its advantages. It has a wonderful color, the finest colored we have; it is also of very fine quality. It begins in late July and runs through August—sometimes into September"
July 2012: The tree produced about 12 fruits. All very clean and large. They seemed to have increase in size in the last 4 weeks. I picked the 3 shown in the pictures bellow and will pick a couple every week. They should get larger in to 36-40 oz this year. They are growing by the day. August 23, 2012: If you leave them in the tree some fall but others keep growing and improve flavor. I picked some in the 47 plus oz range. April 14, 2013. In the fall I pruned both trees and they did not set a single fruit this year. I'm going to miss them. May 22, 2013. There are a couple of fruit. In the future I know not to prune this trees too hard. June 1, 2014: I found two fruit in one of the trees. I will keep and eye on then weekly. July 4, 2014: I have two trees one has more fruit than the other. The one closest to my neighbor's Simmonds is doing better with more fruit set. Concluding that Pollock benefits from an A flower tree flowering at the same time. Unfortunately these two Pollocks are now in a section full of Monroes, B flower type. The fruits are now easily 20-25 oz by the end of July they will be 30-40 oz of delicious avocado.